1 acorn squash or a butternut squash. Either will work fine. We prefer Acorn. I don't have an exact recipe here for you, bear with me. The good news is that you practically CAN'T screw this up and it will taste heavenly! This recipe yields a pot of gorgeous, steaming, orange hued, mashed potatoes with the most divine flavor ever. IT man would happily sit down with a bowl of this stuff just by itself and I can't cook this without stealing a lick now and then. OK, a small bowl worth. But once you try this you'll understand. 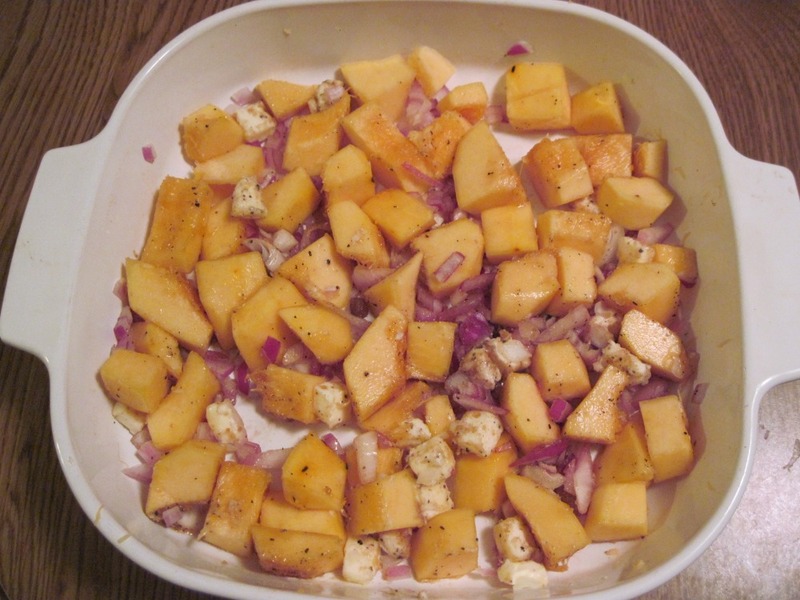 Peel and cut up about 3 cups worth of butternut or acorn squash. What you want is approximately 1½ inch size cubes of organgey gorgeousness. Toss these lovelies with a half, reasonably finely chopped yellow onion, 1 tbsp. brown sugar, and no less than 2 tablespoons of butter cut into pieces. Come one, you know you want it, add another tablespoon, it's sooooo worth it. 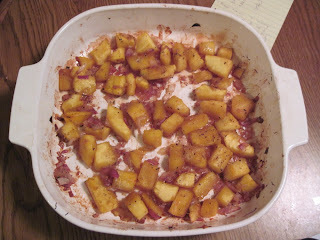 Now, toss all this together along with some pepper and salt to taste and spread out on an aluminum lined cookie sheet. Pop this into the oven at about 350 F and let it bake. Stir once in a while. You'll probably open the oven door more often than you need to just to smell that amazing, heavinly, aroma of caramelizing onions and squash. Meanwhile peel and cut potatoes. 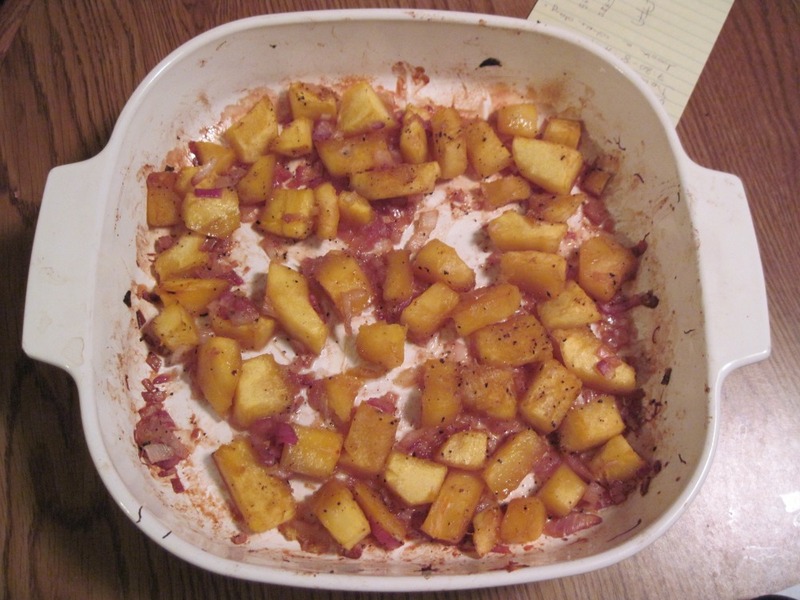 You'll want about 5 cups of potatoes cubes approximately 2 inches in size. Boil these with a pinch of salt until tender. Before you drain them retain 1 cup of the starchy liquid. When the potatoes are cooked and drained, mash them well. Use some milk if you want, or the starchy liquid you reserved. Cook the squash until quite tender and the onions pleasingly browned. Pour the whole mess into a bowl and mash. 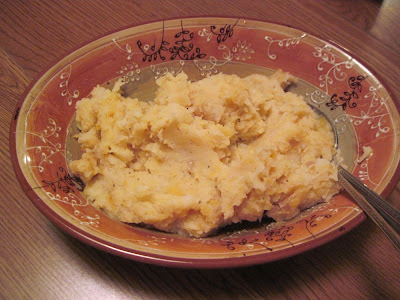 Add the mashed squash to the mashed potatoes and stirr. This is fabulous with your turkey dinner or any dinner for that matter. If you want to fancy it up for a nice presentation top each serving with a dollop of black pepper crusted goat cheese. By popular demand I'll be serving this again on Thanksgiving. After coming out of the oven. I should have added more onions but it's still yummy.